• On-time del" very increased over a three-year period from75 percent to 98 percent. • Supplier delivery performance increased from 75 percent a 85 percent . • Manufacturing cycle time was dramatically reduced. • Inventories were reduced roman average of 5.3 months to 3.9 man hrs. Source: Provided courtesy of the Oliver Wigh Companies, New London, H.
models presented in the previous chapter are often applicable This IS especially true when the demand for these types of products are considered to be in$Pendent.and relativelyConstant throughout the year. However, there is another category of products: the subassemblies and components that go into these end products. For this group of products, he demand is not independent, but rather, it is dependent on the demand for the end products in which they are used. For example, the demand for automobile tires is dependent on the demand for cars. Similarly, the demand for keyboards is dependent on the demand for personal computers. In. both cases, once the demand for the end product has been established, be it cars or happens the demand for the components used in these products can be determined easily. 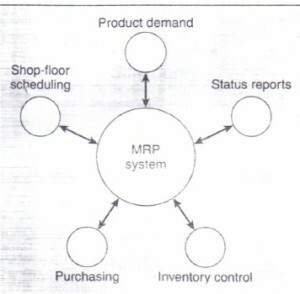 To address the inventory issues that are associated with these types of products, a concept known as materials requirements planning (MRP) is used.MRP was originally designed as a stand-alone system that operated almost exclusively within the manufacturing or operations function of a company. Today, an MRPsystem is often integrated into an enterprise resource planning (ERP) system, which is typically organization-wide. In essence, as shown in the comparison between Exhibits 17.1 and 17.2, what MRP initially did for manufacturing,in, terms of integrating all of the various operational elements, ERP is no doing across all of the functions within an organization. Over the years, the role of MRP has changed significantly. initially, MRP was used primarily for shop-floor control within the company. Today, many of the leading-edge manufacturing firms, however, use JIT for shop-floor control and utilize MRP to determine the subassembly and component requirements that are supplied by vendors, as shown in Exhibit 17.3. With continuous emphasis on reducing both inventories and lead times, the need for accurate information, in terms of the quantities of individual items required and their respective due dates, is mora important today than ever before. And this type of information is readily provided with MRP. 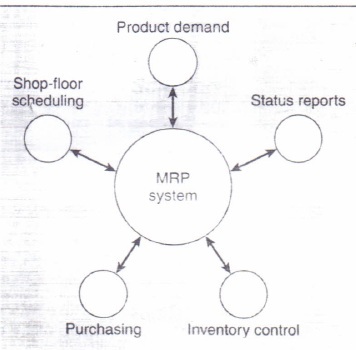 MRP systems. in part or in whole. are used in manufacturing firms both large and small. The reason is that MRP provides a logical and readily understandable approach to the problem of determining the number of parts. components. and raw materials needed to produce each end item. \IRP also provides the time schedule specifying when each of these materials. parts. and components should be ordered or produced. he original MRP planned only materials. However. as computer power and speed increased over the past 20 or so year, and applications expanded. so did the breadth of MRP. 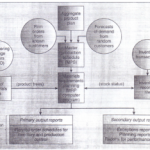 Soon it considered resources as well as materials: now MRP also stands for manufacturing resource planning (MRP II). which will be discussed later in this chapter.